Faced with the insurmountable task of building upon their surprising 2014 outing, “Ótta”, Sólstafir made the reasonable decision to pursue another direction for its successor, and out of the band’s experiments emerged “Berdreyminn”, a lighter, yet no less emotional undertaking befitting their quest to always progress and evolve as musicians. The album still delivers the barren grandeur of Sólstafir’s native Iceland in musical form, but the result is faster and more avantgarde than anything the group has produced thus far, roping in elements of neofolk and progressive rock to spice up their foundation of doomy, grungy post-metal. But while these innovations are quite prominent across the album, “Berdreyminn” still has Sólstafir written all over it. When riffs rain down in the likes of the opening track, “Silfur-Refur”, they are seen to retain the epic proportions for which the Reykjavík-based outfit is revered, just like frontman Aðalbjörn Tryggvason’s voice retains its unmistakable intonation, strain and magnitude. If anything, he has added even more emotion to his singing now, his voice breaking and cracking in despair as his cries and roars go unanswered across the lonesome wilderness one envisions whilst listening to songs like “Nárós” and “Ambátt”. Both of those tracks have the classic features of Sólstafir, but the seeds of new ideas have also taken root in them. There was a change of personnel in the band before “Berdreyminn” came to be, with Hallgrímur Jón Hallgrímsson taking over from Guðmundur Óli Pálmason on the drums, and it seems like he brought with him a penchant for a more driving style of percussion, which is easily heard after the halfway mark in “Nárós”. “Ambátt”, meanwhile, moves the spotlight onto session pianist Halldor A. Björnsson, whose graceful and uplifting melody — played ever so slightly out of rhythm — offers respite from the desolation and melancholia that hang heavy over the album, and actually transforms the track into something resembling the cinematic post-rock of Nordic Giants (whom Sólstafir incidentally toured with in 2015). The two songs are also great examples of the movement toward an increasingly atmospheric sound that runs like a red thread through “Berdreyminn”. Nowhere is this shift more apparent, however, than in “Dýrafjörður”, which plays out like a bleak ambient folk piece, and in doing so draws parallels to the band’s countrymen and close friends in Árstíðir. Orchestral flourishes have been a permanent fixture of Sólstafir’s music since 2011’s “Svartir sandar” and they reprise their role once again here — yet as “Dýrafjörður” reveals, that role has become very prominent. Trumpeting sounds of French horn, flugelhorn and tuba mingle nimbly with grand piano, cello and violin, and even soprano singing by Margrét Soffía Einarsdóttir, in passages that often verge on symphonies, and in the magnificent crescendos of more traditional Sólstafir fare such as “Ísafold” and “Hvit sæng”. With this litany of classically trained session musicians bolstering the quartet, music that was already transformative in the first place is thus bestowed with a truly transcendental feeling, which has the likes of “Bláfjall” still ringing inside your head long after that song has brought the album to its conclusion with its droning tremolo riff, d-beat drumming and dramatic swathes of organ. Writing a retrospective review such as this has the advantage that the repercussions of the album at hand have already been felt. 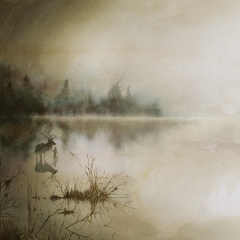 And as was to be expected, given the reduced amount of metallic content on “Berdreyminn”, Sólstafir have seen the waters of their fanbase divide between those who appreciate the band’s genre-agnosticism and will to evolve, and those who longingly return to “Köld” to find the Sólstafir they love. That record still remains the masterpiece of Sólstafir’s career, but while “Berdreyminn” never threatens to unseat it from the throne, it is nonetheless a refreshing exercise in pushing the envelope of what this band is supposed to sound like. The familiar sombre tone and enormous reach of the music remain intact, but Sólstafir explore their signature sound with a different set of tools here, and take another praiseworthy step in their pursuit of unending progress.